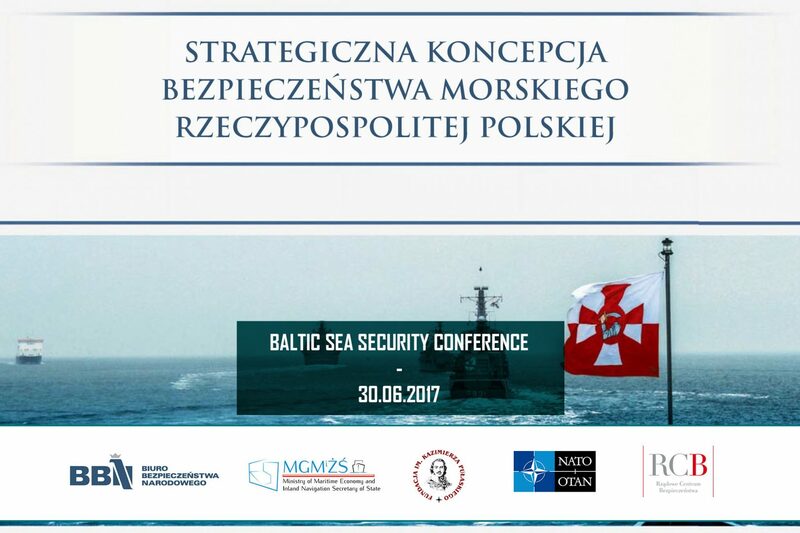 We are glad to inform that “Strategic Concept of Maritime Security” prepared by the National Security Bureau will be presented during the conference Baltic Sea Security 2017 organised by the Casimir Pulaski Foundation. The conference aims at providing a platform for discussion on security and defence cooperation in the Baltic Sea Region. The document entitled “Strategic Concept of Maritime Security” is composed of four parts describing the maritime environment, the naval assets of the Republic of Poland, the directions of development of their capabilities and recommendations on their development. It is supplemented by two attachments discussing the legal order of the seas and oceans, as well as the characteristic features, the legal and international status and the geopolitical situation at the Baltic Sea. The strategic concept was developed by a task force which started its works in February 2016 and was initially led by Jarosław Brysiewicz, Deputy Head of the National Security Bureau, replaced by Dariusz Gwizdała in November 2016.